The VYCON VDC Flywheel is an energy storage system that holds kinetic energy in the form of a rotating mass and converts this energy to electric power. Using patented technology that includes a high-speed motor generator, active magnetic bearings, and a superior control system, the VYCON VDC Flywheel can charge and discharge at high rates for countless cycles. 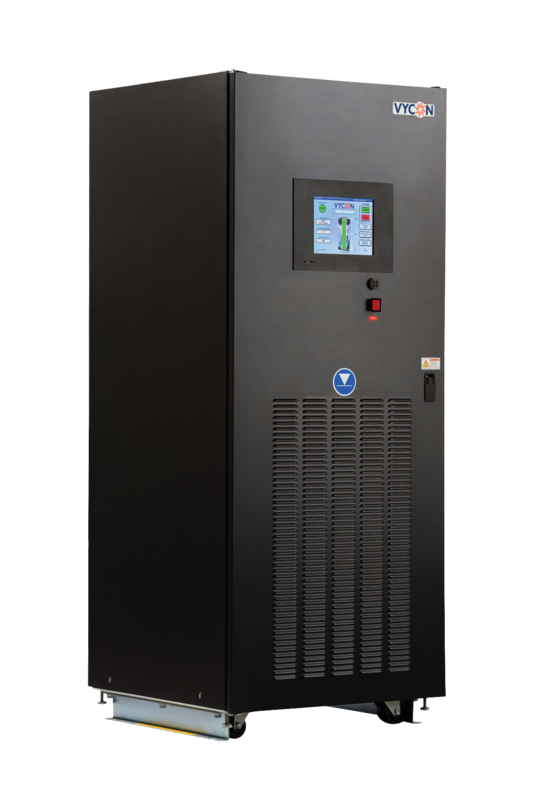 The Flywheel technology is a battery-free solution ideal for applications where the utility requires frequent UPS support and the runtime requirements are short. This includes data centers, healthcare facilities, broadcast stations and other mission-critical operations that require up to 30 to 40 seconds of backup power. NFPA 99 regulations for Emergency Power Systems for medical facilities stipulate that generator sets must be able to assume the load within 10 seconds. While batteries can perform this function, their reliability assumes that they are fully charged, have a complete string of functional batteries, and have been properly maintained. By contrast, VYCON’s Flywheel systems provide reliable energy storage instantaneously to assure a smooth transition to the stand-by Genset, all in a compact footprint. For longer runtime requirements, The VYCON VDC and VDC-XE Flywheels can operate in parallel with batteries. In this configuration, the VDC is the first line of defense against power anomalies, saving the batteries for prolonged power outages. 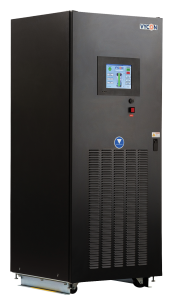 By providing the necessary energy first during power glitches, the VDC system significantly increases battery life by absorbing over 98% of the discharges that would have normally caused the batteries to be cycled. For applications in industrial markets where voltage dips, sags and glitches can shut down sensitive process control equipment leading to lost productivity and wasted materials, the VYCON VDC Flywheel is the perfect solution. 98% of all voltage sags and outages are less than 10 seconds in duration, all of which can be solved by the energy stored in the Flywheel. Because the VDC Flywheel can operate in harsh environments and occupies very little space, it is the ideal solution for industrial applications. For more in-depth specifications, see the VYCON VDC Flywheel brochure.